Kim Evey, The Guild co-producer, came out and announced the first surprise. A video started playing and the audience just went wild! It was The Guild music video called â€œDo you want to Date my Avatar?â€ written by Felicia Day and Jed Whedon. The characters were all dressed up in their avatar costumes and the dancing and acting was hilarious! When the video ended, the cast of The Guild â€“ Felicia Day, Sandeep Parikh, Robin Thorsen, Jeff Lewis, Vincent Caso and Amy Okuda â€“ walked out, all dressed up in their avatar costumes! They were welcomed by a standing ovation. It was an amazing entrance by an amazing group of people! As for the last surprise, there will be a â€œGuildâ€ comic book written by Felicia Day and published by Dark Horse Comics! The Guild panel was probably the most exciting one that morning. You had the cast of The Guild and Felicia Day sitting in front of you, the writers of Dr. Horrible â€“ Joss Whedon, Jed Whedon, and Maurissa Tancharoen in the front row, and letâ€™s not forget the new Guild cast member, Wil Wheaton â€“ all in the same room. This was indeed a star-studded session! For more information about The Guild, see WatchTheGuild.com. If youâ€™re a super Twilight fan, you were probably waiting in line with the screaming girls on Wednesday night. 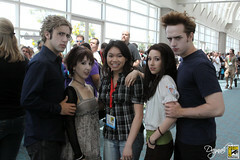 But if you missed the panel, you may be just as happy to meet the cast of Twilight Parody from The Hillywood Show. They strolled around the convention center in their Twilight attire. The Hillywood Show makes parodies of various movies, but they’ll best known for their 9-minute version of Twilight. Whether youâ€™re a Twilight fan or not, this video is worth checking out for a few laughs. Go to TheHillywoodShow.com for more information. 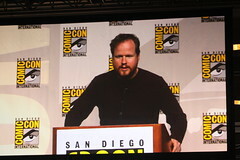 Other Comic-Con highlights included Joss Whedon taking the floor of the main room to talk about his upcoming projects, and of course Dollhouse. He mentioned that because of all the fans, Dollhouse will be returning for another season this Fall. During the panel, the audience was treated to a full unaired episode of Dollhouse, featuring Felicia Day! Itâ€™s not a typical role youâ€™ll see her in, and Joss assured us that weâ€™ll be seeing more of her in the next season. After the showing, we were greeted by Dollhouse stars Eliza Dushku, Fran Kranz, and Dichen Lachman. â€¨Although there are many amazing panels to attend to, you canâ€™t leave Comic-Con without stopping by the exhibit halls for a few hours. Booths from your favorite movies, webisodes, games, books, and of course, comics were tightly packed in the exhibit halls. And each one had special goodies to give away. New to Comic-Con this year was the addition of their official iPhone app (iTunes link). Although many improvements can be made, this app proved to be very useful during the event. The first screen showed the countdown of when the exhibit hall opens/reopens. The â€œNewsâ€ screen aggregates the news from their website. The â€œProgramsâ€ screen displays a list of events and panels, sorted by day and time. The search option made it easy to find events to attend to. After searching for your events, you can â€œadd to favorites,â€ however, the option to â€œview favoritesâ€ was not available. Hopefully theyâ€™ll add this option by the next event. The â€œExhibitsâ€ screen made it very easy to search and find your favorite exhibits. And lastly, the map made it convenient to find where exactly everything was. Donâ€™t take everything handed to you. Youâ€™ll be carrying it all day, so be selective! Prioritize your events before heading to the conference. Bring your own poster container(s). Bring a backpack or large bag to carry all your goodies. Bring water, drinks, and snacks. Wear good walking shoes because youâ€™ll be standing or walking most of the day. Be prepared to stand in very long lines. Most of the popular sessions are happening in Ballroom 20 and H. If most of the sessions you want to see are in there, you might want to stay there for the rest of the day. The line to get in is about 3 miles long! Bring DVD covers, books, and anything you plan to have autographed! Of course, donâ€™t leave home without a camera. Come with friends. Itâ€™s an experience that should be shared! Plus having someone to talk to in line would be nice as well. Thereâ€™s just so much to see and do at Comic-Con, and so very little time to do it in. If youâ€™re interested in learning more about Comic-Con, see their official website. Article was originally posted on iProng Magazine.